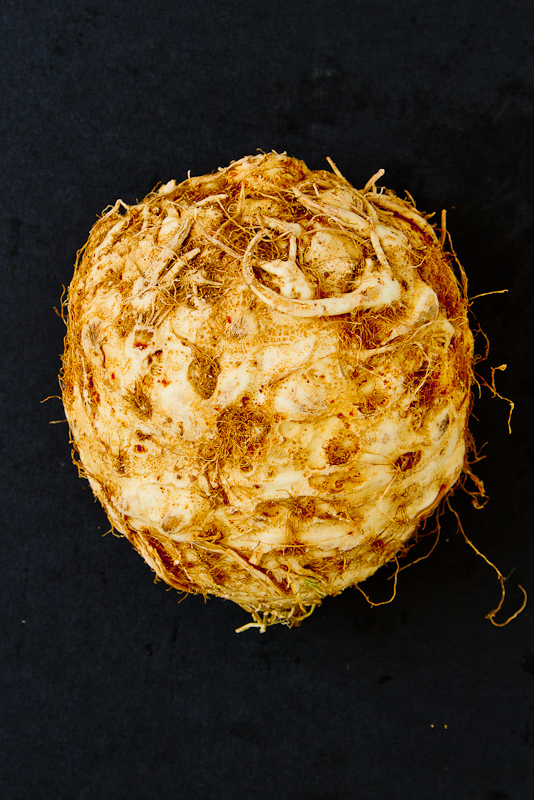 Celery root has long been popular with the French. It’s native to the Mediterranean and they love–as do we we–making it into purées, soups and of course a raw salad with rémoulade dressing. Samuel de Champlain was probably not the first European to encounter them – he saw cultivated fields of them on Cape Cod in 1605 – but he does get the credit for sending them back to the old country. It was not a case of unalloyed love at first sight. 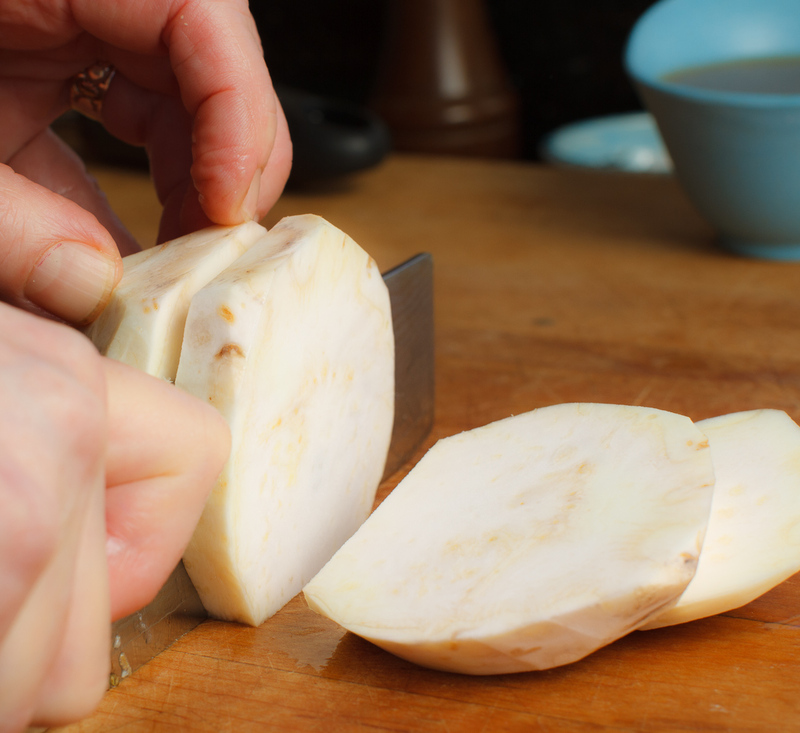 According to the food writer Peggy Trowbridge Filippone the French people long avoided Jerusalem artichokes in the mistaken belief that their consumption could cause leprosy (from a perceived similarity between their shape and that of the ravaged fingers of leprosy victims). Later, because they were one of the few things, along with rutabagas, available to eat by the French during the Second World War they came to be thought of a poor people’s food. *My mother shares the prejudice about rutabagas, because of the frequency which her family consumed them in New York City during WW II. Heat 1 tablespoon butter in a heavy-bottomed saucepan over medium heat. Add the onions, give them a good stir, cover, and cook until tender, about 5 minutes. 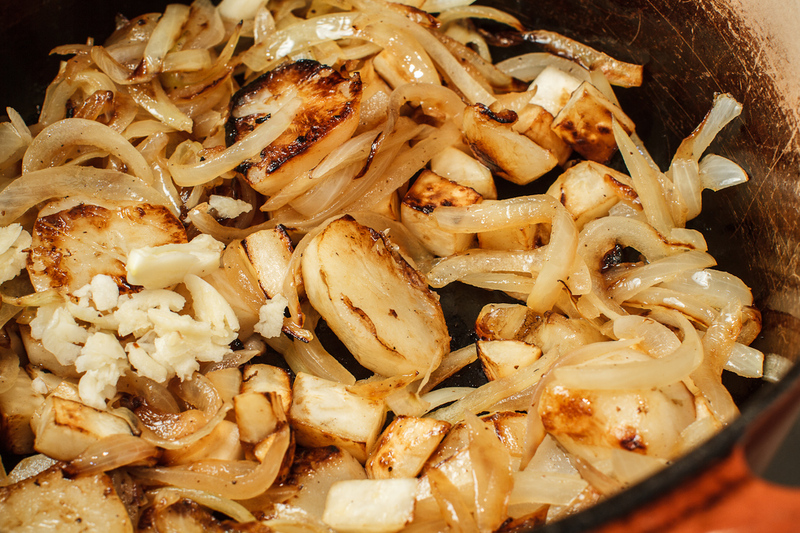 Remove the cover and continue sautéing the onions until they’re lightly browned, about 5 minutes. Take care not to burn them. Season with salt and pepper. Transfer the cooked onions to a bowl. Add the remaining butter to the saucepan. 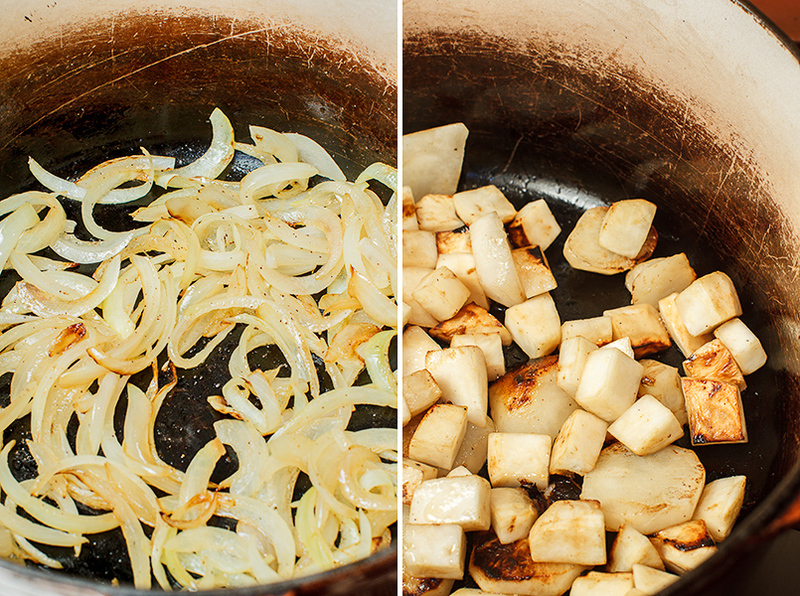 Add the celery root and sunchokes and sear all over. Turn the heat to low. Add the garlic, return the onions to the pot and season with salt and pepper and cook 1 minutes. 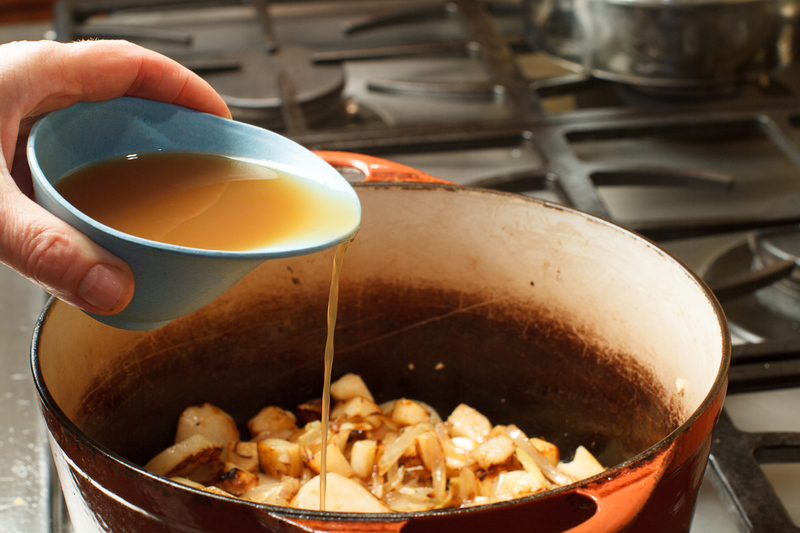 Add the apple cider and reduce to a glaze. Add the chicken stock and cook until the roots are tender enough to purée, about half an hour. 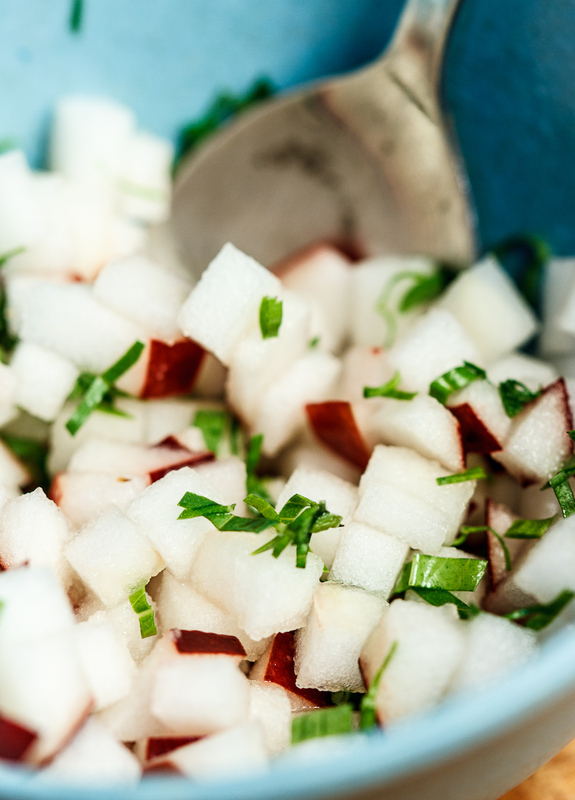 Remove from the heat and use an immersion blender to puree to a smooth consistency. Alternatively, you can strain out the stock and puree the solids in a food processor or blender, adding stock as needed to make a smooth puree. 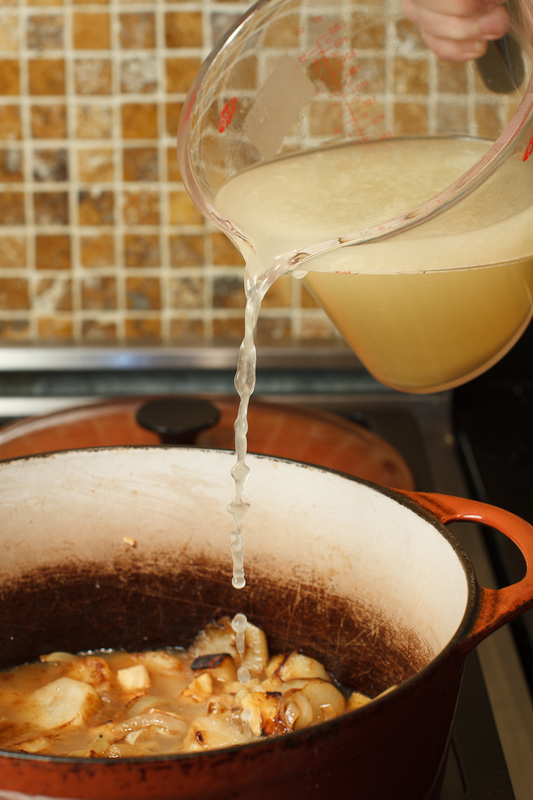 Return the puree with the stock to a clean pot. Whisk in the cream and and 1 tablespoon lemon juice. Taste and adjust seasonings, adding more lemon juice if necessary. Toss the apples with the remaining lemon juice and the tarragon. Grate the frozen gorgonzola over the soup and then top with the apples and celery leaves. 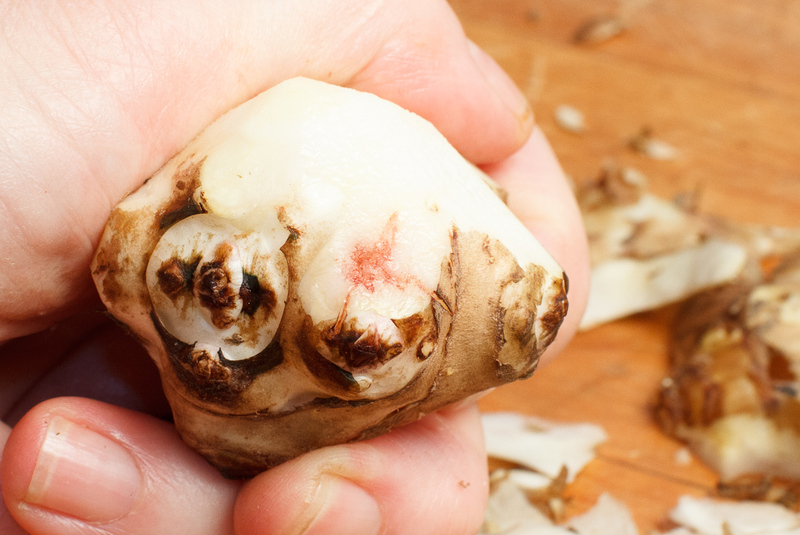 Ignore any red discoloration – the sunchoke is fine. So this is embarrassing. Feel free to make fun of us. 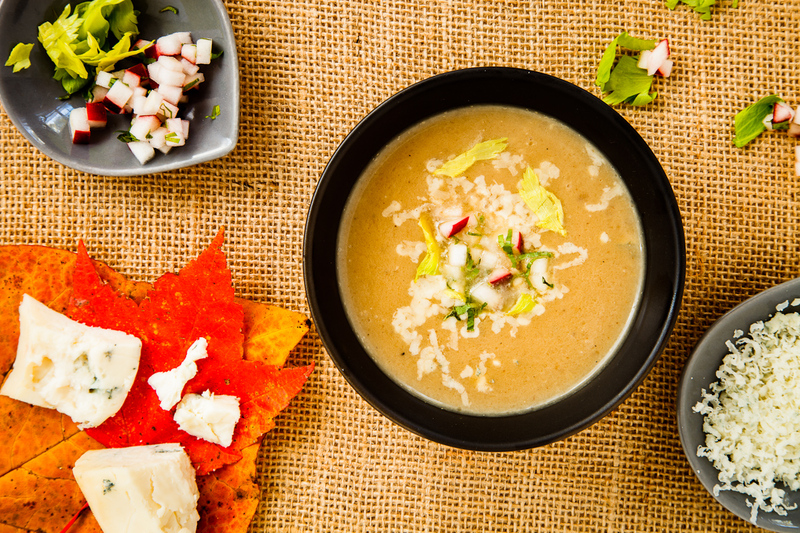 But the two soups are different enough that we decided it’s worth posting this one. Since sunchokes are inherently sweet the soup needed much less cider–I reduced it by three-quarters, but it would also be delicious without any cider at all. The other change I made was to cut the butter in half. The proportions in this recipe are well balanced so don’t be afraid to use it as a soup template. 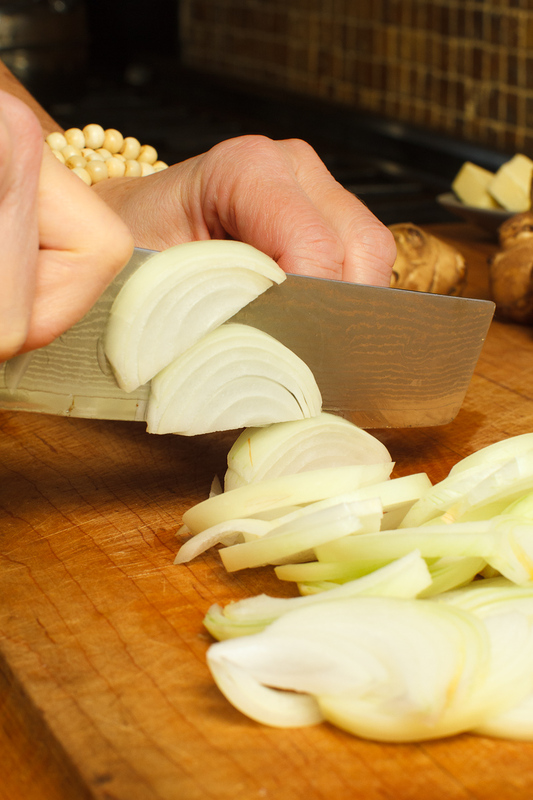 Try substituting leeks for onions, for example; or squash instead of celery root and sunchokes. 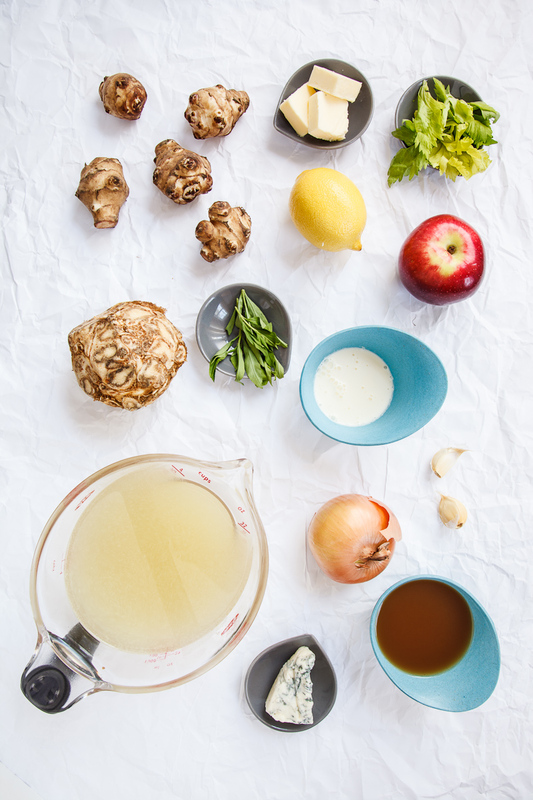 You could add wine instead of cider, olive oil instead of butter, vegetable stock instead of chicken stock, thyme instead of tarragon, ginger instead of or in addition to garlic. You get the picture. This entry was posted in Easy, Soup and tagged autumn, celeriac, celery root, cider, Gorgonzola, inulin, Jerusalem artichoke, Samuel de Champlain, soup, sun root, sunchoke, topinambour. Bookmark the permalink. They’re both great! (And yes, you are allowed, cook’s prerogative, to post two versions.) After yesterday, soup season is officially here. I’ll put this on my soup of the week list–it would be a great starter for Thanksgiving, or even better, to eat with turkey sandwiches. Fabulous photos and great instructions, thank you. The soup ‘reads’ very appetising indeed, can’t wait to try it. (P.S. 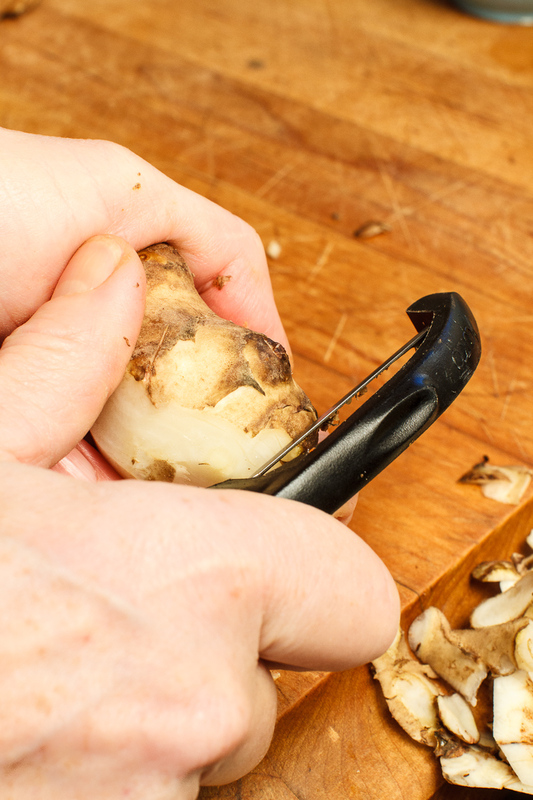 In Italy too, Jerusalem artichokes are called ‘topinanbour’, I wonder why …). You could also have said you posted the newer version for all of us who have regarded the celery roots when shopping and wondered ‘What did I do with that before?’ and kept walking by. Have a Happy Thanksgiving folks. 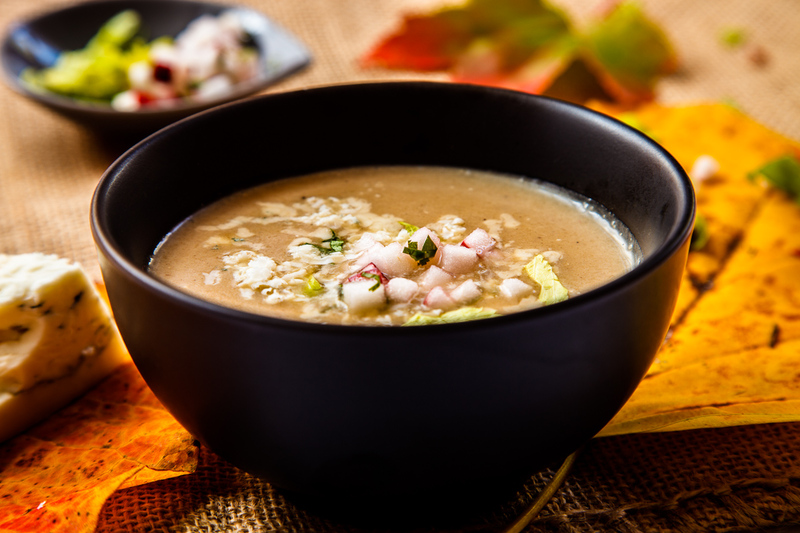 Hi, I’m happy to discover your delicious blog and this marvelous soup! I love sunchokes and I can’t wait to try it. We’re waking up to frosty mornings now and I have soup on my mind everyday! Thank you for sharing. 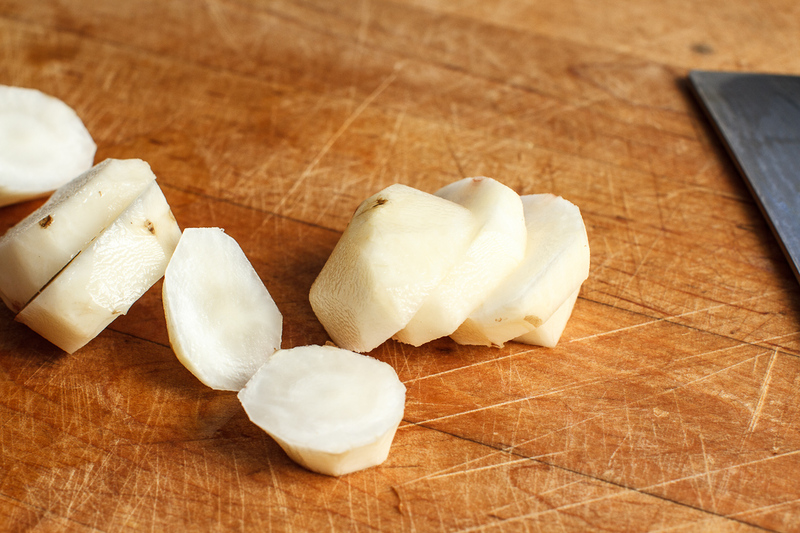 I love celery root, but have to admit to never cooking sun chokes before, perhaps because they are a rarity at my regular markets. Don’t worry about recipe replication, I’ve done at least 3-4 different brownies on Oui, Chef….you’ve got some catching up to do. That is so funny about the recipe. We did the same thing recently! Both the original and the variation sound great. And that is the loveliest celeriac I’ve ever seen! Thanks for turning me on to sunchokes. I hate to admit it but when I’ve seen them in the store I’ve never really know what to do with them so this was a learning experience.